VICTORIA - An unlikely visitor to Vancouver Island is recovering at an animal rescue centre after being found, shivering and injured, on the Victoria waterfront. The female brown booby is receiving treatment while staff at the British Columbia SPCA's wild animal rehabilitation centre try to figure out how the tropical bird travelled far north of its usual territory. Centre spokeswoman Marguerite Sans said there's very little research on migration of the brown booby, but the seabirds have been known to travel up to 3,000 kilometres. "Because we know so little about them, it's not too clear why they might appear this far (north) but I think it might be a combination of this individual going further up the coast and then perhaps storm or weather patterns pushed her up further," Sans said. A powerful storm packing moisture from east of Hawaii lashed the B.C. coast in the days before the bird was found. When the booby, believed to a young adult, was found Monday it was very ill, suffering from a small puncture to its chest, injuries and abrasions to its feet and was underweight. "Based on her blood work and how thin she is, we are pretty guarded as far as her prognosis because when they get that emaciated they are pretty critical," Sans said.The bird is too weak to eat whole food so it is on a special diet that will keep its organs from shutting down. Sans said it could take several days before the lethargic bird responds, and even longer before plans can be made for its release. "If we can get her past the tough part, we have to see," she said. "With any seabird species we need them to be in excellent body condition and then also have pristine feathers so that their waterproofing is 100 per cent before they are released." The brown booby is a large seabird, with a wing span of nearly 1.5-metres and is identified by a solid brown head, neck, back and wings, with a white chest and lower body and a yellow beak. The bird is usually spotted in Mexico, California and Hawaii where it's renowned for dramatic 20 metre plunges into the sea to catch seafood such as squid and anchovies. Sans said it was the first time the centre has cared for one of these seabirds, and staff are mulling the logistics of how to get it further south, if that's determined to be the safest way to release the bird when the time comes. Nigel, the gannet, was an individualist, cut from a different feather than the other birds of his species that, for decades, had flown past the predator-free island of Mana, just off the New Zealand coast, without ever thinking to stop and build a nest. But Nigel stopped, pulled to the island’s cliffs by solar-powered audio recordings of gannet birdsong — plus 80 decoy gannets — arranged in the (human) hopes that a place devoid of seabirds might grow into a bird colony. Nigel, a young male, appeared about five years ago, which is when she appeared to him: a concrete gannet, freshly painted yellow and white, that Nigel would woo. He built her a nest of mud and seaweed and twigs; performed a mating dance; craned his long, white neck, shook his tail feathers and pledged his love to her, and only her. Gannets are monogamous. Nigel stayed true to his concrete mate, chirping in her ear, making love and continuing to nest alongside her, even after three living gannets alighted on the island in recent weeks. Nigel was aloof to these newcomers. He had made his nest and, sadly, that is where Chris Bell, a New Zealand conservation officer, and the sole human resident on the island, found him dead — just as real life had finally flown his way. Some day soon, Nigel will be transported to Massey University in north New Zealand, where an ornithologist specializing in bird autopsies will pry open his chest seeking to determine the cause of death. They may find that Nigel was aged, or diseased, but what they won’t be able to gauge is the loneliness in his heart from being committed, as he was, to a relationship that was all give and no take. Nigel’s bond, not to flesh and feather, but to concrete, is sad and cruel, and perhaps a cautionary tale — for the age of loneliness in which we humans live. The time where text messages pass for conversation; strangers on Facebook are counted as friends; “likes”, not hugs, or actual human interaction, are sources of warmth; and coffee shops can seem as quiet as tombs, with patrons entranced by the cold, unloving glow of their laptop or smartphone screen. We’re sick, us humans, or at least some of us are. Like Nigel, we struggle to pry ourselves away from our stone lovers, failing to recognize that what is real, and beautiful, and bursting with life is right in front us, if only we would lift our gaze (spread our wings?) and see it. Nigel, the gannet, died as some individualists do in the end: alone, on the cusp of something great, surrounded by concrete fakes, aloof to the arrival of the living and unable, or unwilling, to change his ways. Unfortunately the booby in Victoria has died in care - not so much from its injuries (breast and feet) but due to starvation and dehydration. Too rough and long a ride for a tropical bird unfortunately. Laysan albatross Wisdom is back! Wisdom was first banded in 1956 by biologist Chandler Robbins, who estimated that she was about five years old at the time. The biologist and bird met again in 2002 when he went to band her and recognized that she had been one of the 8,400 birds he recorded during his first season, 46 years previously. But her fertile contributions to the continuation of her species make every homecoming a celebration for scientists. Last year, they observed a chick that she fledged in 2001 setting up a nest just a few feet away. It was the first time one of her chicks had been documented returning to nest. Every time I see a story about an Albatross named Wisdom, brings not only a smile, but a proud tear for this species to my face! She is one extraordinary and amazing bird that has caught our attention, and captured our hearts. This is one strong determined bird that beats the environmental odds! What an inspiration she is, and will always be! Wisdom has taught us so many things about survival! 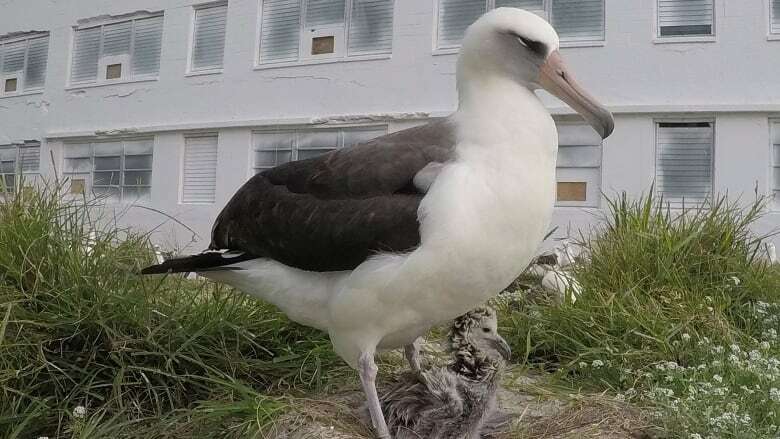 The oldest known wild bird in the world has become a mother again at the Midway Atoll National Wildlife Refuge, U.S. wildlife officials said. The Laysan albatross named Wisdom hatched a chick earlier this month at the remote atoll northwest of Hawaii, the Honolulu Star-Advertiser reported Monday. Wisdom is at least 68 years old and has raised at least 31 chicks, U.S. Fish and Wildlife Service officials said. Wisdom was first banded as an adult in 1956. Wisdom and her mate, Akeakamai, have been returning to the atoll to lay and hatch eggs since 2006. Laysan albatrosses mate for life and lay one egg per year. "She's incredibly powerful as a symbol of why we do what we do and why people all over the world pay attention to her," said Beth Flint, a Fish and Wildlife Service biologist. "Wisdom is rewriting history about our understanding of survivorship, how long birds live, and how often they breed." Albatross parents take turns incubating an egg for a little over two months. Chicks fly out to sea about five to six months after hatching. They spend most of their lives flying over the ocean — feeding on squid and fish eggs. Midway Atoll is home to about 3 million seabirds, including about 1 million albatrosses. They return to the places of their birth to nest and raise their young, according to the Fish and Wildlife Service. "Midway Atoll's habitat doesn't just contain millions of birds, it contains countless generations and families of albatrosses," said Kelly Goodale, biologist at the refuge. "If you can imagine when Wisdom returns home she is likely surrounded by what were once her chicks and potentially their chicks."